You rush up the subway stairs. You’ve been running all day. Now it’s time to wonder why. So, a blackboard stand waits for you atop the Vernon-Jackson Avenue subway station. It’s as though someone placed the board near the corner just to tell you it’s time to slow. Pays to advertise. Blackboard directs subway riders at Vernon-Jackson Avenue to Station LIC, an eatery and bar. You walk left. You open a tall thick wooden door. A twelve seat bar with room for 55 seated diners. A train station motif. High ceilings. Exposed wood beams. Brick wall behind the bar. The joint is more than wine, beer, top shelf hard liquor and ten house specialty cocktails ($12). It’s even more than a menu with selections ranging from the crudo Tuna-Hamachi ($14) to the Charred Octopus with Jalapeno Pesto ($18) to the Pork Duo with Parsnip and Bacon ($15). And the one who made Station LIC work? How about a Ukrainian with a Bachelors of Architecture Degree from Pratt Institute, and a Master of Science Degree in Advanced Architectural Design from Columbia University. He’s Gregory Okshteyn with a talktomebaby resume. But, nobody gets this good alone. Station LIC ‘s operation runs under the command of an operating partner named Michael. He resembles the young Sidney Pointier and dresses like a man who knows Madison Avenue. But, that’s neither here nor there. A floor to ceiling window looks out onto Jackson Avenue. The window is from another era. Your eyes go to the window. A movie unfolds for you. A couple kisses on the street corner. Green taxis, yellow taxis and a bicyclist whiz along the avenue. You wonder if the ghost of Fellini stands near. Maybe the most notable floor to ceiling window along Jackson Avenue in Long Island City. James Moody and Hank Jones play on the bar’s sound system. The sound of classic jazz slows everything for you before your first sip. James Moody’s saxophone gives you your moment to reflect and that’s when you notice a hazed 100 year old glass window in the corner of the 2400 square foot room. The window’s glare goes red when the street light goes red. Then green when the light goes green. But, the most memorable moment is when a silhouette climbs the stairs. You watch the silhouette ascend the stairs and you wonder if you just saw the ghost of Charlie Chaplain in Long Island City. And just when you think you’ve seen enough for one night, there is something more to see at Station LIC. A large black and white painting hangs against the wall near the hazed corner window. It’s a painting of an antique fan so realistic you mistakenly labeled it a photograph. ‘The Fan,’ an original artwork by Shimon Okshyetyn displayed at Station LIC. And then you hear the story behind the painting. The painting is Gregory’s wedding gift from his father Shimon Okshyetyn , a Ukrainian artist who lives and works in Brooklyn. His works graced museums in Prague, St. Petersburg, Russia, Rochester, N.Y. and the Whitney Museum’s permanent collection in Manhattan. On December 17, Station LIC will celebrate its one year anniversary. Monday thru Sunday: 5 p.m.-2 a.m.
Bathrooms: Absolutely must see to believe. (Just that amazing). Parking: Depends on day and hour. 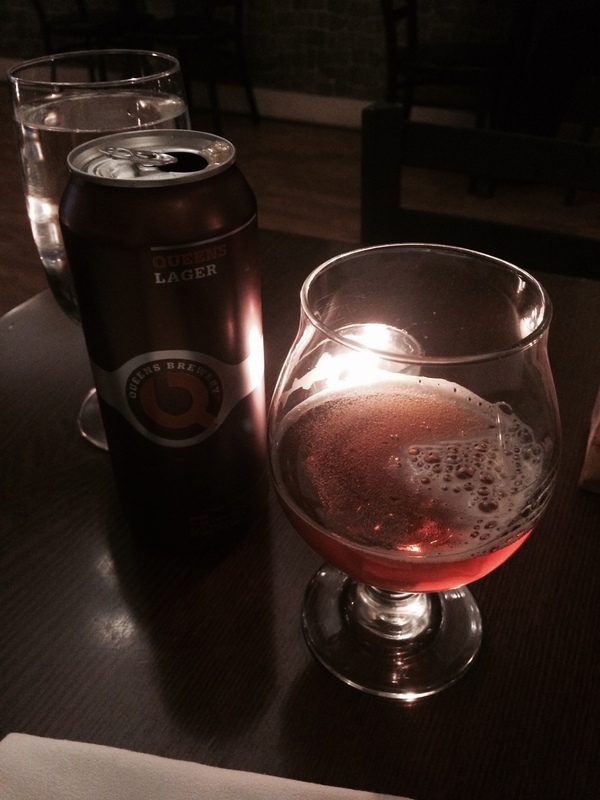 Looking for a gastropub? The DOG and Duck. 45-20 Skillman Avenue. You wait at The DOG and DUCK playing the game. She’s not far. It was your idea to meet at the bar. You check your phone. You’re starting to think maybe she’s fled. Just hold on, bro. Chill you’re at The DOG and DUCK. A Sunnyside neighborhood joint. Moonlight hits Skillman Avenue and comes through the gastropub‘s large windows. The room’s warm and cozy though the walls beg for art work. Welcome the night while looking out on Skillman Avenue at The DOG and DUCK. The door opens. It’s not her. You wonder–’tis the season when you’re heart gets broken? Thirteen beers on tap. A selection of Red Wine, White Wine, Sparkling Wines and Andy’s Fall and Winter Cocktails with names like Figa, 46th Street Makers and Hair of the DOG (&DUCK). Isn’t that enough to keep you happy if you come down with a case of holidaze? Or, maybe you want to choose from the DOG and DUCK’S full menu which includes Bar Snacks, appetizers, selections from the grill, from the sea, braised, roasted and stewed selections, rice, pasta and side dishes. The barkeep comes over. You’re about to ask for a 46th Street Maker when your phone lights up. You get a text. She’s not far. Your cocktail arrives. ( Makers 46, English Marmalade, Lemon, Vanilla, Sweet Vermouth, Angostura’s Bitters). Two sips later someone taps you on your shoulder. Ain’t no holidaze here, Jack. How to find a Decent Man. Seek Out Saints & Sinners. What’s in a name ? Saints & Sinners. 59-21 Roosevelt Avenue, Woodside. You still can’t find a decent man? Don’t matter, baby. Go listen to Amy Winehouse sing ‘Someone to Watch Over Me.’ Then march yourself over to Saint & Sinners Pub in Woodside. Rectangular bar in the middle of the room. Dining room in the back. Alcove with a fireplace looking out onto Roosevelt Avenue. A bevy of beers on draft including Sam Adams Boston Lager ($6) and Smithwicks. Dark cozy lighting. Eight Hi-def TV’s on the walls. Comfortable leather bar chairs. Framed black and white photographs from Ireland on the walls. A bartender from Dublin who wins your heart the minute she walks over: “How you doing, hun?” And a thump thump from the pub’s sound system that makes you forget everything. Wherever you sit you can view a Hi-def TV. Happy Hour: Sunday, Monday, Tuesday and Wednesday. Funny thing is that when #thekidfromqueens sat for his Sam Adams beer there were just two women in the pub except for the bartender and a waitress. Enough beers on tap at Saint & Sinners to satisfy the most discerning of beer drinkers. So, why you sitting home and dreaming? Inside Saints & Sinners you’ll find the types you read about. They rush into buildings to save those trapped in rooms. They hammer nails into 2 x 4’s. Their hands are coarse, but their hearts are large. They look you in your eye when they talk. You see their happiness and their sadness. And any minute, you expect one of them to turn to you and recite a line from a William Butler Yeats poem. So, what are you waiting for, baby? Saints & Sinners serves breakfast, lunch and dinner. Their dinner specials change daily. The specials go something like this: a Soup of the Day (Beef Barley, $5), Appetizers (Chicken Parmesan Flat Bread $9.95), Entrees (Lemon Chicken, $17.95), Dessert (Baileys Cheese Cake, $7). Oh yeah, you don’t have to dress like a star. That’s not my line. It’s Amy’s. 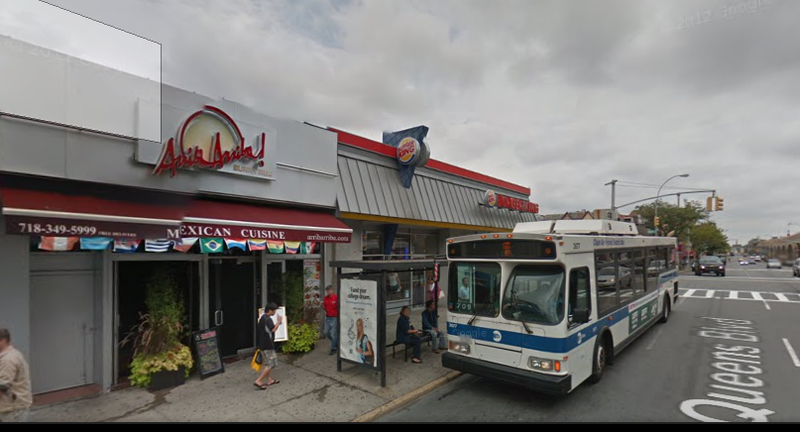 Amy would have been happy you stepped off Roosevelt Avenue and took a chair inside The Saint & Sinners Pub. Because, without girls like you there would be no fun. Kitchen Hours: Sunday-Monday: Noon- 10 P.M., Tuesday-Saturday: Noon-11 P.M. Parking: First car to the meter wins. Need a First Date Spot? Arriba Arriba in Sunnyside Works. You’re Johnny on the Spot. You texted your flirtationship all week and now you’re Under Pressure for a first date suggestion. Here’s the move if you’re near Sunnyside. Do Happy Hour at Arriba Arriba. Middle of 40th Street on Queens Boulevard. You got parking. You got a bus stop. You got the 7 Line station at 40th Street. Honestly, you’ve got no excuses. Mexican cuisine goes with a first date like Romeo and Juliet. Crazy? Don’t think so. Ever notice how scent of fresh corn tortilla chips puts a smile on your face? If that doesn’t do it, take a look at the Frozen Margarita machine at the end of their bar. 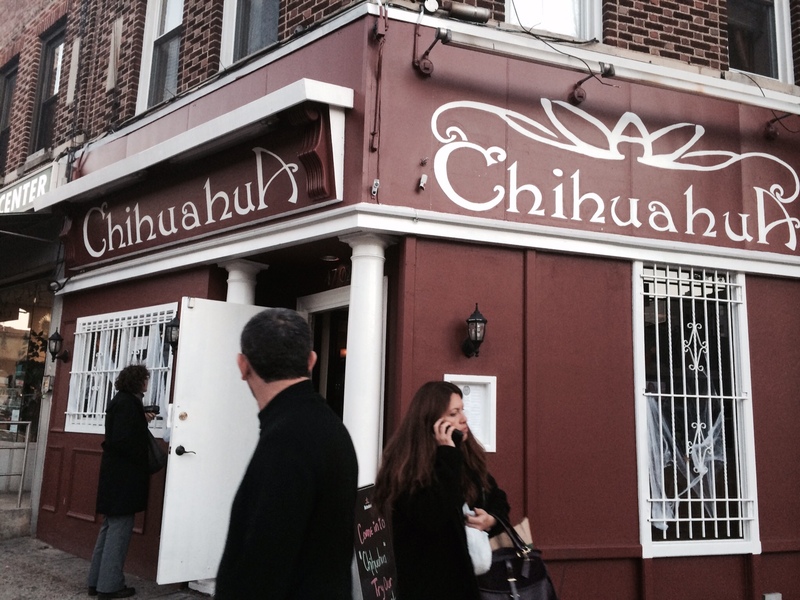 Arriba Arriba’s got a shout out from Gothamist in 2014 as one of the ten best Margaritas in NYC. Find a Facebook fanatic not laughing after a few sips into a Frozen Margarita and you’ve found someone in need of serious meds. So, what do you say? It’s a Happy Hour mingle. Spend the chedda and tell yourself ‘you got to be in it to win it.’ You work. You’ve got a paycheck, so spring for a Frozen Margarita at $6 a pop. Or do domestic beers or Sangria at the same price. Go for a business provocative look if it’s Happy Hour at Arriba Arriba or somewhere else. Even the bartender thinks so,too. 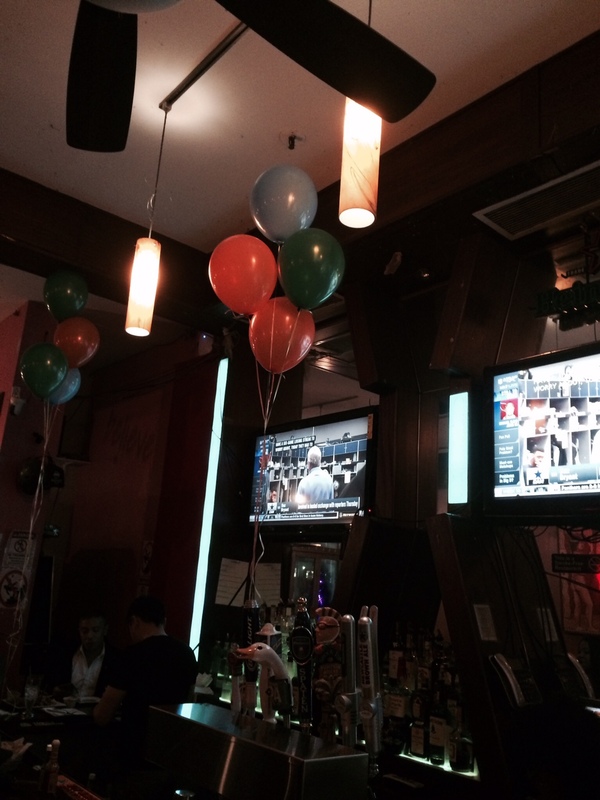 He pins balloons in the middle and at both ends of the bar. Five high-def TVs on the walls. An array of imported and domestic beers on tap. A choice of Los Coladas ($10.00) and Arriba Mojitos at the yougottabekiddingjack price of $11. So, do the Mr. Big thing. Take a seat on the banquet. Let your friendgirl look at the mural that runs length of the wall. Drop the macho dude bit and go artsy. Start the conversation with that mural. You like it? What do you think it is? Who is the artist? You even like art? Latin music thumps at a decimal level that’s agreeable enough for conversation at Arriba Arriba. The lighting is low. Busboys run up the stairs carrying plates of food. Every dish is perfect for sharing. Not bad for bonding, huh? Happy Hour runs 4 p.m. to 7 p.m., so the clock is ticking on your rap and If you can’t get it going or don’t feel Lucky Lust hovering you’ve got two plays. You can step outside and hop on the bus, Gus. Or, turn left and watch the Stephanie Sigman wannabe hostess greet customers into Arriba Arriba as they step off The Boulevard of Dreams. But, let’s think positive, okay? You’ve made a splash. There’s hope for a second date. Happy Hour: 4 p.m.-7 p.m. Happy Hour at The Claret Wine Bar, Sunnyside. It’s Like You Hit The Pick Three Lottery. Don’t they seem happy? 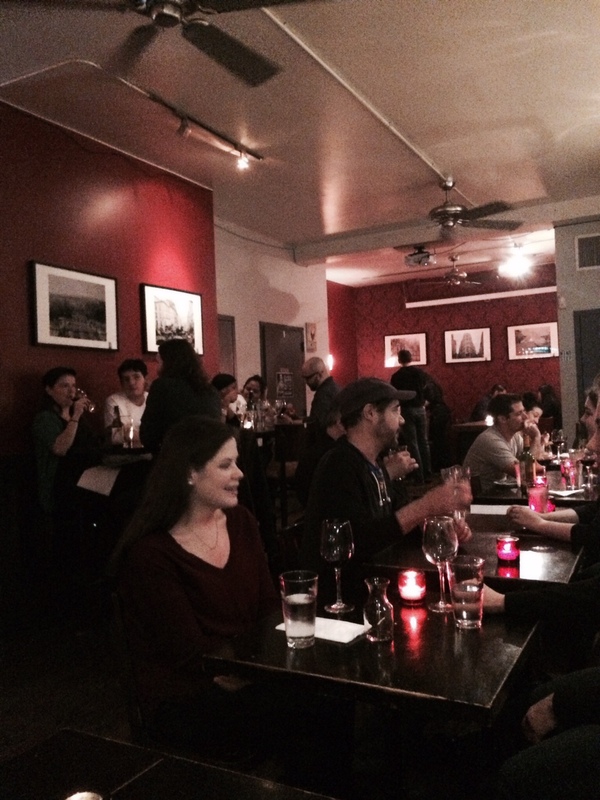 Friday night Happy Hour at The Claret Wine Bar, Skillman Avenue, Sunnyside. If you discover Happy Hour at The Claret Wine Bar in Sunnyside you might feel as though you just hit The Pick Three lottery. Don’t say a word and just listen, Buckaroos. Choice of three bottles of wine and plain ten inch cheese pizza for $25.00. Selected a Sauvigon Blanc Argentinian wine. Astica, 2014. From Mendoza, Argentina to Skillman Avenue. Isn’t life amazing? Wine arrives in somebody’s Big Idea. A sturdy plastic Ice Bag. Filled with water and crushed ice. Who needs a better mouse trap? 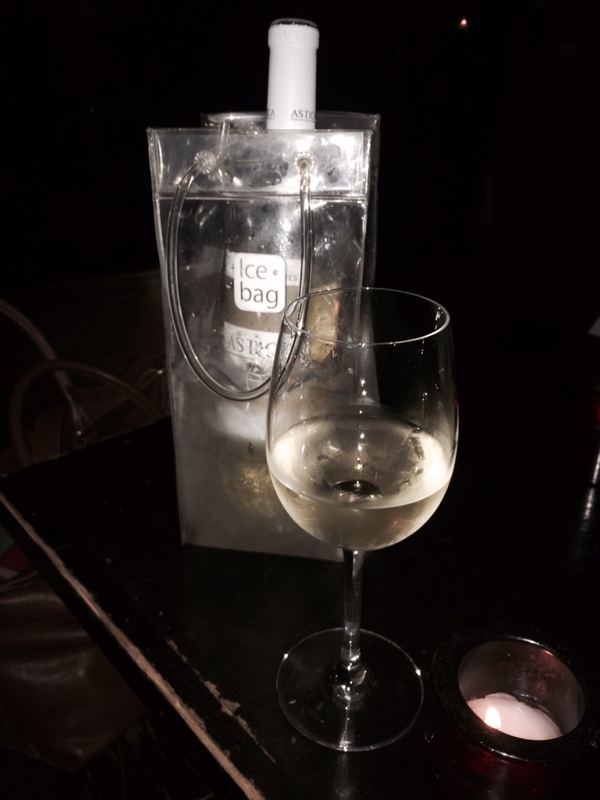 Here’s a better way to chill wine. First taste in and you realize it really is Happy Hour. Hint of grapefruit,fresh and tangy, if you believe that stuff. But, this much is a fact: Light and perfect for a Friday following a day of Excel spreadsheets. 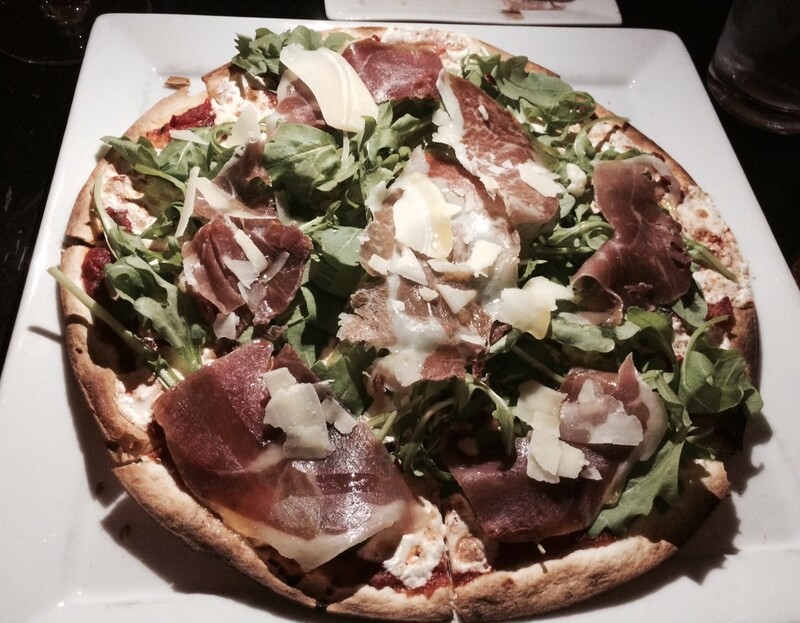 Felt so good, upgraded the plain cheese pizza to include prosciutto, arugula and shaved Parmesan Cheese. Halfway into the bottle of Astica the work week went the way of our beloved Mets. Focused instead on the Claret’s eleven seat bar. Everyseat taken. Sam the Scroller searching his Iphone for messages. Harry the Hipster speaking to Cinderella. And, Paula the Poet channeling the vibe of that late Sunnyside Muse, Suze Rotolo. Everybody’s content and why not? Six beers on tab. A chalk board off to the side of the bar lists three varieties of whiskey. American, scotch and Irish.And if that’s not your preference you’ve got a list of more than 100 bottles of wine to find your happiness. Buy the bottle or buy the glass. Happy Hour, of course, doesn’t stand still. Darkness falls. You notice a candle on each table. You turn to the large window that looks out on Skillman Avenue. The leaves are changing. You’re across the street from the Sunnyside Gardens Market. That awning is long and oh so green, dude. Who cares? The room fills. Ceiling fans go in slow motion overhead. You hear laughter. You see the smiles. The music plays. It’s J.J. Cale. You are happy. Yet, there is more to feel good about at The Claret Wine Bar. 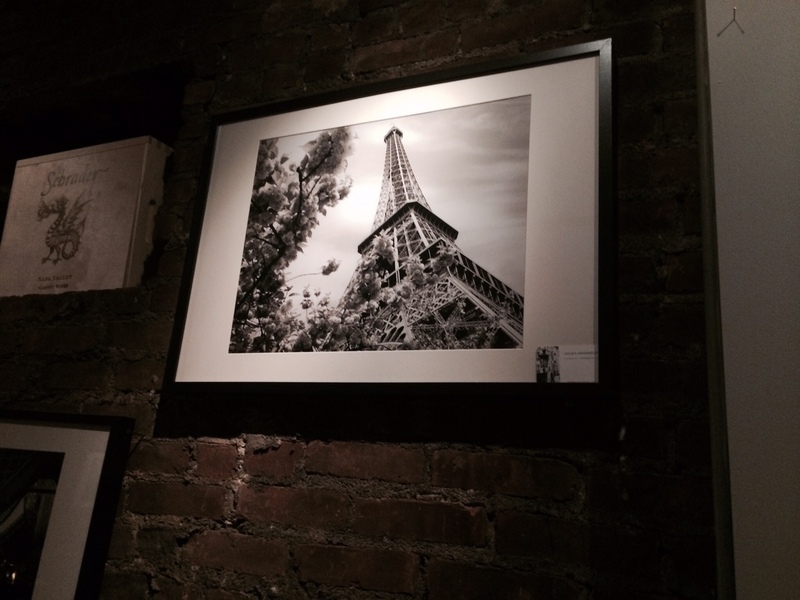 Black and white large format photographs hang on the bar’s exposed brick walls. Meanwhile, You see the food come out of the kitchen. A Beet Salad on a rectangular plate. Red and golden beets border Frisee lettuce topped with Goat Cheese and roasted Pine Nuts. You send yourself a text. “Come back again and give the salad a try.” You’ll have time to come back, too.The Claret Wine Bar has been around since 2008. Parking: Not as difficult as Manhattan. Johnny Delusional sat inside Chihuahua, a Mexican Restaurant and Cantina in Sunnyside. He sipped his red wine and whistled ‘As Time Goes By.’ He checked his flip phone for messages and ran a hand through his grey hair. Think Johnny knows what happened? In August, the Bliss Street Station, an Irish restaurant / bar established in 1989 shut its doors. 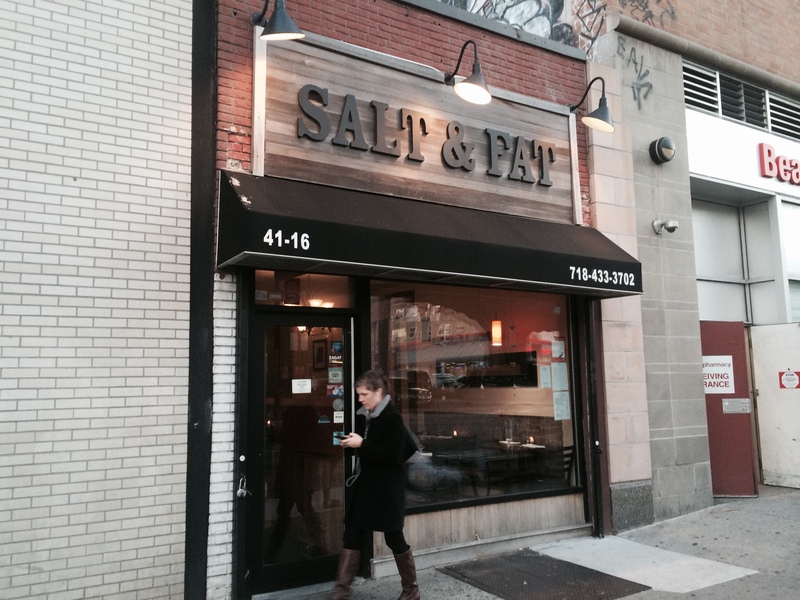 For weeks the corner of 47th Street and Greenpoint Avenue lay dormant. Then, the door swung open. The building’s exterior walls got painted and the only thing that remained from the Bliss Street Station was Johnny. Chihuahua’s sound system carried the timbre of Mexican female singers. Was that Paulina Rubio or perhaps Laura Flores? Hardly mattered, if you must know. Their voices were upbeat. Their lyrics were about heartbreak. Who ever heard of a sweet love song, anyway? 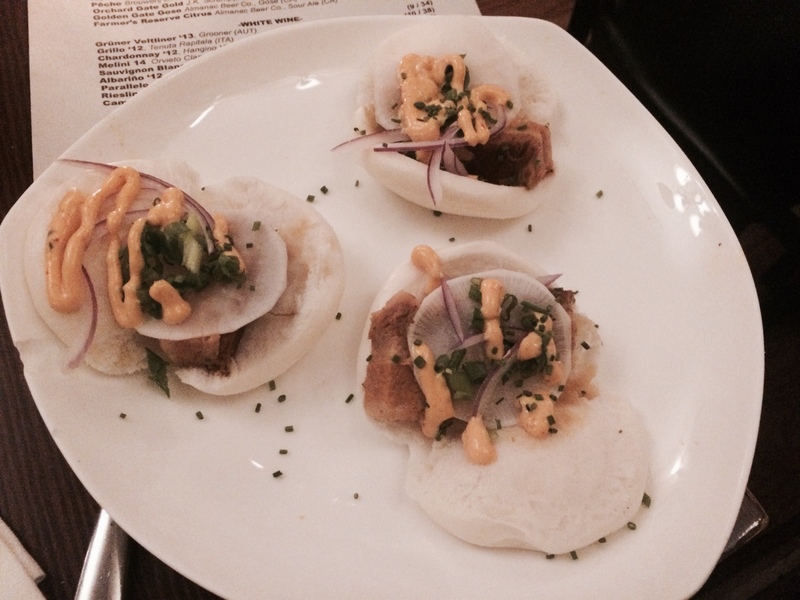 So, there’s a better reason to pull up a seat at the polished bar inside Chihuahua aside from the music. And that reason has nothing to do with the ten cocktails ranging from $7 to $12, or the red, white, Mango or Passion Fruit Sangria. Matter of fact, the reason you want to visit Chinuahua has nothing to do with any of the draft beers. Mahou, from Madrid, Spain. Modelo and Dos Equis from Mexico. Pacific Beer from Tacoma, Washington. Nor does that reason have to do with their menu which is representative of Mexican cuisine. A server found us at the far corner of the bar. She greeted us with a smile. We gave a short answer after she asked how we were doing. We wanted to say something about her black hair tied back, but said nothing. Instead we noticed that in one hand she carried a small silver bucket filled with fresh corn tortillas. In the other a ramekin filled with a rich maroon colored sauce. “It’s mole sauce,” she said. 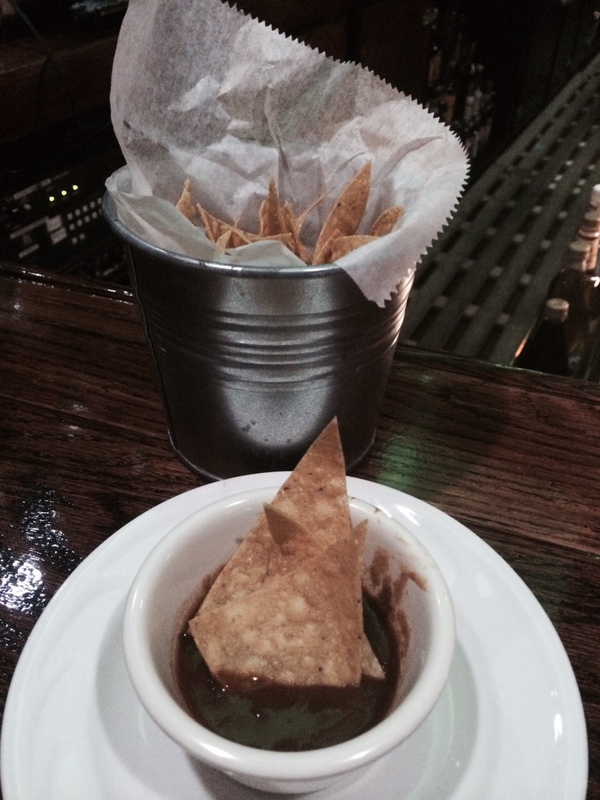 We dipped the corn tortilla into the mole sauce and it was like we discovered the best kept secret in Sunnyside. The mole at Chihuahua is of OMG quality.It’s made with peppers, onion and blended with chocolate. Slow cooking at its best. It’s somewhat spicy, but the flavor gives you the feeling you get when you meet someone and you just know this is love. Time passed. The sky grew dark. More customers entered Chinuahua. Young adults sat at tables. You saw them take photos with their Iphones. Then, you looked at Johnny. He remained at the bar. He still whistled. He checked his flip phone again. You heard him ask for more of that mole sauce and you knew everything was right in the world. *Call for hours of operation. 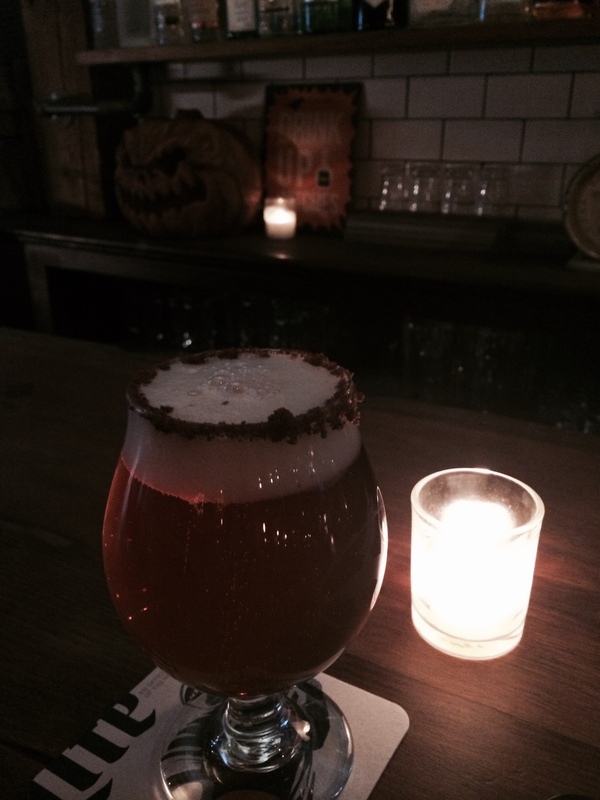 Why pick pumpkins when you can drink PumKing Ale at Maggie Mae’s in Sunnyside? Been there, done that. Not all it’s made up to be. Instead, go for merry and warm inside what just might be the most rustic bar in Sunnyside. A forty foot long finished wooden bar top. A list of drafts, stouts, wheat ales, lagers and cocktails written on blackboards above the bar. A dark stained wooden floor running from the front door to the back wall. Black and white checkered tiles beneath the bar. Comfortable red leather stools with backs at the bar.Three high definition televisions situated between top shelf Bourbons, Whiskey’s and an assortment of Gin and Vodka.The lineup is Met like in its appeal: Angels Envy, Knob Creek, Woodsford Reserve, Hill Rock Four Roses, Jack Daniels Single Barrel and Maker’s Mark. And if that line up isn’t enough, there’s A vast basement bar, only opened Friday and Saturday. Ideal for an incognito meet and drink. Low ceiling. Dark lighting. Swing your partner round and round. Yet, there’s one more reason to find yourself inside Maggie Mae’s. She’s from outside Dublin. The sound of her voice might make you want to stay inside Maggie Mae’s and listen to her all day. But, who has the time? The car is honking. Everyone wants to go pumpkin picking. Saddle up to the bar, folks. 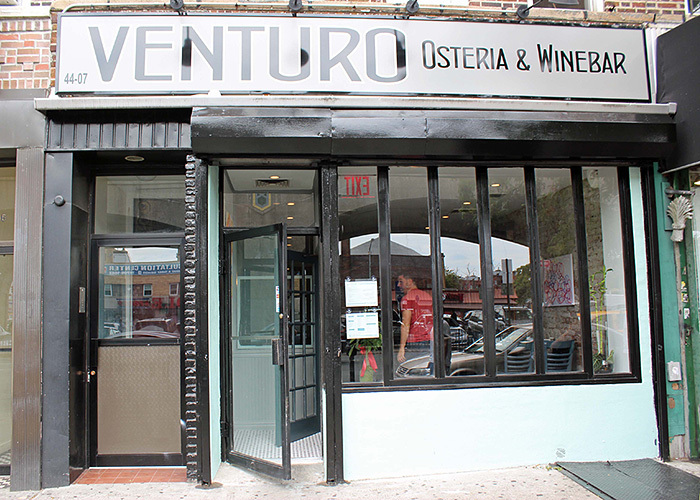 It’s Happy Hour at Venturo Osteria and Wine Bar in Sunnyside. Benghazi, Hilliary and Donald are not in our thoughts. We’re here to get happy and that’s our story. Everyone knows it,too. The bartender does his part. He passes over Venturo’s Happy Hour menu. House Cocktails for $7 between 4pm to 7pm. Selected vino for $5 and selected beer for $4. A cocktail called East of Sunnyside which contained Mayfair gin, gran classic, lime, mint and cucumber sounded great, but our day called for something stronger. If you wish there is a small selection of appetizers to go with your drinks, but this time around we’re here for something more than food. Vodka on the rocks with lemon, please. 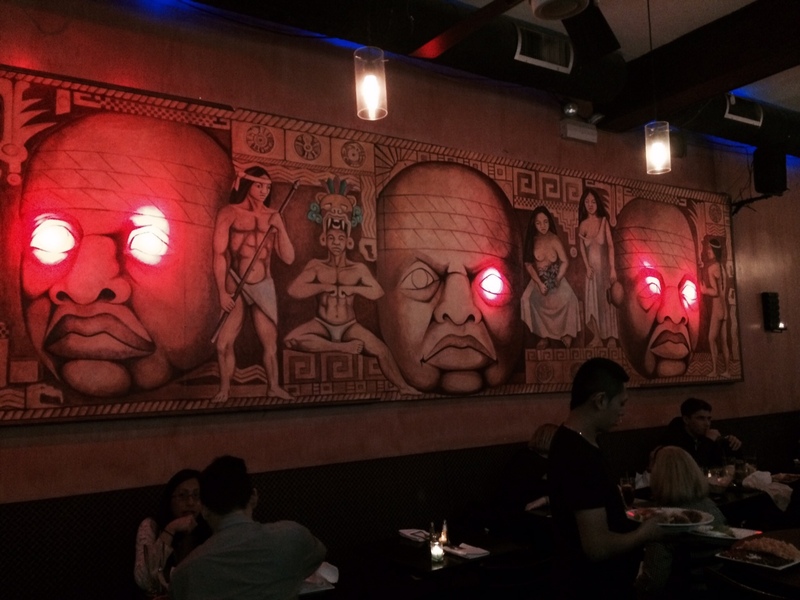 Two sips into the vodka and the décor at Venturo reset our mood. Dark stained wooden plank floors. Beige painted brick walls. A built-in-book case with a mirrored backdrop for bottles of Italian red wine. Framed silhouettes along the wall. A sound system that was neither too loud nor too soft. A small outside eating area and two clean bathrooms. After our second vodka the small bar filled. Three well dressed women talking about the Picasso exhibit at The Museum of Modern Art. Two fashionable men talking about ‘ a big birthday.’ His thirtieth. And what about the service ? The bartender and woman working the floor could not have been more pleasant. If you must know, we’re already planning a return trip to Venturo. Good place to saddle up and get happy.